Anyone who’s spent time in Seattle recently knows from the cranes punctuating the skyline, the new restaurants in every neighborhood, and the traffic jams that business here is booming. 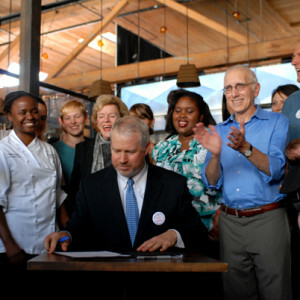 Seattle’s paid sick and safe leave ordinance went into effect in September 2012, guaranteeing most people working in Seattle the right to earn paid leave. The initial evaluation report released by the City this week confirms that since the Paid Sick Days law was implemented, jobs and businesses have grown faster in Seattle than in surrounding cities. The ordinance has succeeded in expanding access to paid sick leave, especially in restaurants where the percentage of companies providing it increased from 14% to 78%. More outreach needs to be done targeting both businesses and workers to assure everyone has access. 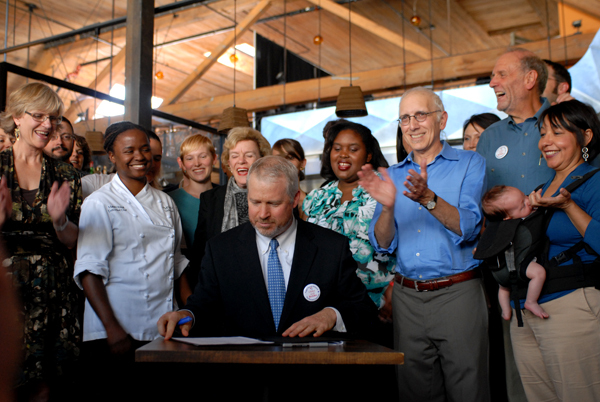 A number of small business owners supported Seattle’s paid sick leave ordinance from the beginning. In fact, several helped write the policy. But a vocal group of business lobbyists opposed passage and have grumbled since. Now we know that opponents are a small minority. According to the new study, 70% of Seattle business owners support the law. A team of University of Washington researchers commissioned by the City used confidential data from the state to compare Seattle’s economy with Bellevue, Everett, and Tacoma. They also conducted two comprehensive surveys of employers, just as the law was implemented and one year later, and in-depth interviews with small samplings of employers and workers. Overall, 37% of employers reported changing policies in response to the ordinance, including 13% that previously had provided no paid leave, 29% that increased the amount of leave, 25% that expanded eligibility, for example to part-time workers. A third of employers added paid “safe” leave for dealing with issues such as domestic violence or sexual assault. During the campaign for the ordinance’s passage, grocery workers and nurses were among the strongest advocates. Many of them already had sick leave, but did not receive pay until the third day out. They testified to the difficult choices they faced between staying home with a sick child or for their own illness, and loosing needed family income. The UW study confirms the ordinance has made a difference. A full 17% of employers reported they changed policies to provide first day paid sick leave. Most of the workers interviewed were enthusiastic about the ordinance – although nearly half were unaware of it before the interview. Those who had gained access to paid sick leave had primarily found out about it from their employers, and described using it for a sick child, their own illness, and for medical treatment following a car accident. Nine in ten surveyed employers believed the ordinance had no impact on most aspects of their business, including customer service, employee relations, or turnover, and 82% said it had no effect on profitability. Some had initial hassles with implementation, but those largely resolved after the first few months. The study authors concluded that most employers believed they were complying with the law, but that only 61% appeared to be in full compliance. Smaller companies are mostly meeting the requirements, but many larger employers appeared to be failing to meet some provisions. This evaluation shows Paid Sick and Safe Leave has been a success, but implementation is clearly still a work in progress. Many workers and their families have benefited. Fears about costs to businesses proved unfounded. But far too many workers and employers remain unaware of their rights and responsibilities. Perhaps the best way to get the attention of employers that are currently ignoring Seattle’s law is for the state of Washington to step up and pass statewide paid sick and safe leave.